The International Bylaws can be amended by majority vote at any meeting of the General Conference. 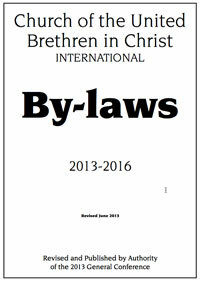 These By-laws provide further guidance for governing the Church of the United Brethren in Christ, International. The Bylaws can be changed by a majority vote of the General Conference. Local churches in a country may become a national conference in the Church of the United Brethren in Christ, International. a. It consists of at least five churches within that country. b. It is a legally recognized entity within that country. c. No other United Brethren national conference exists in that country. d. It is organized with a constitution and other governing documents. e. Its governing documents, teachings, and practices do not conflict with the Confession of Faith, Core Values, Constitution, and Bylaws of the Church of the United Brethren in Christ, International. The following procedure will be used for bringing new national conferences into membership. a. The national conference votes to seek membership in the Church of the United Brethren in Christ, International. (1) Its willingness to be bound by the Confession of Faith, Constitution, and Core Values of the Church of the United Brethren in Christ, International. (2) An official request to be considered for membership. c. The governing documents (constitution, by-laws, etc.) of the national conference are submitted to the Executive Committee. d. The Executive Committee appoints a membership committee to examine whether that national conference meets the requirements for membership, and to consider any other relevant information and criteria. e. The membership committee makes a report to the Executive Committee or General Conference concerning the request for membership. f. The General Conference approves, by a two-thirds vote, the request for membership. a. Upon approval of the General Conference, a national conference will have full privileges of participation at General Conference. b. National conferences shall be notified of all meetings of the General Conference and Executive Committee, and shall receive minutes of those meetings. (1) Sever their relationship with the departing national conference. (2) Ask the Executive Committee to determine their status within the Church of the United Brethren in Christ, International. a. The Executive Committee may investigate allegations that a national conference is not complying with the membership qualifications of the Church of the United Brethren in Christ, International. (1) Protects the integrity of the Church of the United Brethren in Christ, International. (2) Details the conditions needed to bring the national conference back into fellowship. c. The national conference has the right to send representatives to appear before the Executive Committee prior to any disciplinary action being imposed. The national conference must be notified of any potential disciplinary action at least 60 days before the Executive Committee meets. d. If the Executive Committee decides to terminate the national conference’s membership in the Church of the United Brethren in Christ, International, the membership shall end only after a two-thirds vote of the next General Conference. 1. The chairperson of the International Executive Committee shall be the chairperson of the General Conference. 2. General Conference is responsible for establishing a formula to determine the number of delegates each national conference may send to the next General Conference. Although national conferences must choose their own representatives, the preference is that half of the delegates be ministers and half be laypersons. 3. Each national conference is entitled to two delegates—the bishop or equivalent and his or her designee. Observers and advisors may attend General Conference at their own expense or the expense of their national conference. 4. National conferences shall be responsible for the expenses of their own General Conference delegates. This is not to preclude expenses being raised by one national conference and offered for the expenses of those representatives from another national conference. a. The members of the Executive Committee are the bishop or equivalent of each national conference. b. If a member is unable to attend, an alternate from that country may attend as a full voting member. c. The US Director of Global Ministries will be an advisory member of the Executive Committee. Additional advisory members may be appointed at the discretion of the Executive Committee. a. The Executive Committee will meet annually, except during the year of General Conference. The meeting may occur by remote technology. b. Each national conference shall be responsible for the expense of its own representatives on the Executive Committee. This is not to preclude expenses being raised by one national conference and offered for the expenses of those representatives from another national conference. a. Oversee the ministry of the Church of the United Brethren in Christ, International, during the period between meetings of the General Conference. b. Provide for the bookkeeping and other finance-related needs of the Church of the United Brethren in Christ, International. c. Elect from its membership a chairman and secretary. d. Investigate and approve requests for national conference membership. e. Determine the date and location for the next General Conference, and notify national conferences at least a year in advance. f. Be responsible for the program and other organizational aspects of General Conference. g. Promote and facilitate relationships and ministry partnerships among the various national conferences. h. Monitor changes in national conference governing documents, considering how they conform to the governing documents of the Church of the United Brethren in Christ, International. The Church of the United Brethren in Christ, International, is not responsible for the financial operations or liabilities of any national conference. 1. All groups created as part of the international structure will be truly international in scope and membership. 2. National conferences are strongly encouraged to develop partnerships to advance the Great Commission, promote interaction between national conferences, and link resources to pursue common goals. Any ministry partnerships between national conferences need to be worked out between those national conferences. 3. National sovereignty shall be respected. No national conference has the authority to tell another national conference what to do. At the same time, a national conference may decide to discontinue its involvement in a cooperative venture. 4. National conferences should have an international vision, and should consider ways in which they can serve the international church. 5. Representation at the international level shall focus on people, not on monetary resources. 6. Vision needs to be set at the national conference level. 7. We value the connections between United Brethren national conferences, and want to ensure that communication, resource-sharing, and mutual ministry occurs among them. Historically, the United Brethren church has not avoided taking stands on important moral and social issues, whether relating to personal holiness or society as a whole. The United Brethren church recognizes its responsibility to help members apply biblical commands and principles to contemporary issues. The national conferences may wish to address issues specific to their culture, issues which may or may not have relevance in other United Brethren conferences. The Bible is the primary source of correct guidance and the final authority by which Christians should determine proper conduct regarding social and moral issues. The Bible’s specific prohibitions must always be obeyed. In areas where Scripture does not give explicit directions or absolutes, the following guidelines will help national conferences be thoughtful and use biblical principles in taking stands within their culture. 4. Seek the counsel of mature Christians (Proverbs 15:22, 27:17). This might include seeking advice from other national conferences which have already dealt with the issue. 5. If relevant, carefully weigh and consider current scientific and medical evidence regarding the issue (Proverbs 18:15). 6. Consider any harmful effect on others. 7. Consider any harmful effect on the testimony of the members and churches of the national conference (Romans 14, 1 Corinthians 10:32-33). 8. Consider the ways in which other national conferences may have dealt with this issue or with a similar issue. 9. Consider how to deal with the issue while remaining consistent with the denominational Core Values. 10. Give weight to the historical position of the Church of the United Brethren in Christ on this issue or on issues which have parallels.